Explore an exotic new world in this fantastic tale. Millionaire Jan Palmer's fortunes abruptly change when the seal on an ancient Arabian copper jar is broken and a powerful and relentless evil is released - Zongri the Jinn. Imprisoned for thousands of years, Zongri has sworn that whoever sets him free will die. But when he fulfills this vow by slashing Professor Frobish in two, it is Jan Palmer, holding the bloody scimitar, who is caught by the police. For Jan, his problems have just begun: Zongri, before departing, curses him with "Eternal Wakefulness." Locked in a prison cell, charged with murder, Jan comes to a horrible realization of what this means. As he drifts into slumber he finds himself in a strange world, one where humans rank below slaves, where evil Jinn reign and danger is all too real. On Earth he is Jan Palmer, imprisoned for murder, and in the land of the Jinn he is "Tiger," the swashbuckling rogue - but in both, he faces death at every turn. 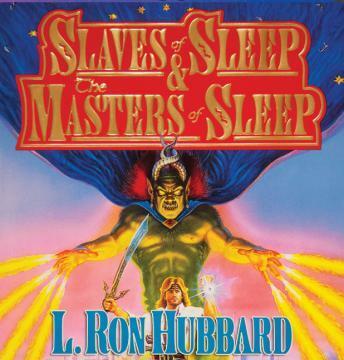 Acclaimed as one of Hubbard's most powerful and timeless fantasy stories. "A master of adventure." --Anne McCaffrey.